Recorded Dec 1998 at Clowns Pocket Studios. Engineered by Derek Nash. Mixed by Deptford Dave at Down Home Studios. Released November 1999 on StayTuned Records. A debut release from StayTuned and an absolutely cracking jazz record. As so often – though small appreciation they get for it – it’s the most musical of musicians who turn to the vibraphone with its complex harmonic and rhythmic requirements. Beaujolais writes crisp idiomatic themes, chooses his repertory material with great taste – Shorter’s “Tom Thumb” up against Waldron’s “Soul Eyes”, “Old Devil Moon” balancing Grant Green’s all too rarely covered “Jean De Fleur” – and he has assembled & drilled a band of real class. Lockheart’s saxophone sound has broadened and grown ever more mature over the last couple of years. He’s shed some (real or apparent) influences and emerges here as a formidable soloist. The rhythm section balances discipline & relaxation and the engineering – step forward, one Derek Nash – is exemplary. Check out the opening “Yes We’ve Met” and the beautifully constructed “Less Said” but above all check out Roger Beaujolais at the first available opportunity. Orphy Robinson may have laid down the torch. Beaujolais is more than fit to carry it. Vibraphone wizard Beaujolais makes welcome appearances on plenty of other people’s recordings, but this is his own first straight-ahead jazz album. It’s a swinging affair, too, as you would expect from from Mark Lockheart (saxes), Robin Aspland (piano), Orlando LeFleming (bass), and drummer Winston Clifford. This celebrates old times for vibist Beaujolais (and indeed for the reviewer) but there may be many listeners who’ve never heard him play straightahead post-bop, and the same may apply to their experience of front-line partner Mark Lockheart. 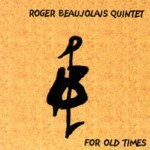 The quintet assembled here (completed by Robin Aspland, Orlando LeFleming and Winston Clifford) prove excellent at sounding as if they’ve nothing to prove. The five catchy originals are mixed with Shorter’s “Tom Thumb”, Hutcherson’s “Highway One” and other canny choices, and the whole session comes off relaxed as well as communicative.